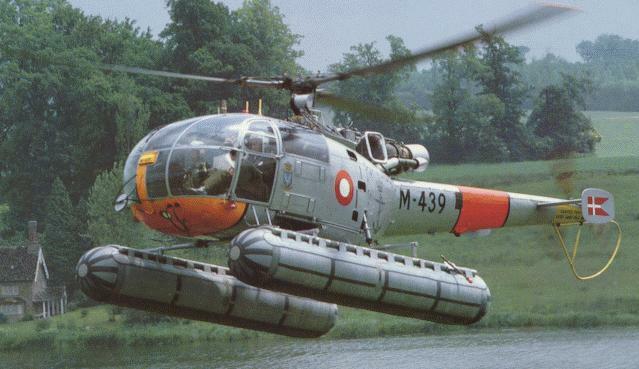 Delta are currently working on a float set for the Alouette III which will be timed to coincide with the release of Joe Maxwell's Max Decals sheet #7204 of International Alouette III's. Other projects in the Delta pipeline are a set of SAS assault frames (squared-off U-frame with supports) for the forthcoming Revell A.109, and a British Special Forces decal sheet for the Sea King, Scout, A.109, etc. Delta are also stockists of the FCM Decals range from Brazil which were featured in HKN recently, and will soon be getting a new line of decals from IPMS Ecuador which will probably include a nicely camoflaged Gazelle. There'll be more details on this next week. Other helicopters currently operated by Ecuadorian forces include the Puma, Super Puma, UH-1H, A109, Lama, Alouette III, 212, 206, 214, and AS 350, so they've plenty to choose from. Maybe you've parted with money for Ecuadorian decals in the past? The IPMS Ecuador website carries news of an unfortunate scam revolving around their last attempt to produce these decals. This time they are being printed by Aztec Decals of Mexico, who already make highly detailed decal sheets for Latin American Blackhawks and MD 500/530 Latin American Defenders. 2. The new Eduard brass sets for the Mi-24 are now available. #48267 is an interior set for the 1:48 Monogram kit, while #72285 is for the 1:72 Hasegawa. It isn't yet known which versions are catered for. An exterior set #48266 for the 1:48 Monogram kit will be coming soon. 3. Hannants have a couple of interesting items in their end-of-line sale list: The Esoteric Hughes 500D #NAV03 is reduced from Ј15 to Ј7.50, and they also have a decal sheet which I've never come across before, Matlan Decals #7201, 3 x Mig-29's & 2 x Mi-28's, reduced to Ј2.50 from Ј3.99. It is not known whether these re-releases will be available outside Japan. If you're thinking of getting the Flying Tigers Sea King, be warned that last time around it wasn't possible to build either the Tiger-striped HAS.6 or the Danish S-61A-1 on the decal sheet from the plastic provided in the box. For the HAS.6 you would need a different radome and other bits, and for the S-61A-1 you would need to change almost everything including the shape of the fuselage and the sponsons. 5. The forthcoming book about Algeria, "The First Helicopter War" by Charles R. Shrader, is now listed by Amazon UK for Ј47.95. Amazon US don't have a price for it yet. Another book you may have missed is "Britain's Rebel Air Force : The War from the Air in Rhodesia, 1965-1980 " by Roy Nesbit, Andy Thomas, & Dudley Cowderoy. It is a history of the Rhodesian AF including some good colour photos of RhodAF Alouette III G and K cars. Also included is an account of every aircraft flown. 6. Last week I mentioned that the next issue of World Air Power Journal will feature the Mi-24, though I was wrong to suggest that this would be the first time a helicopter had been top of their bill - the Apache got there first. The current issue of WAPJ, Vol.36 is just out, and has several items of interest. Firstly there's an article on ALAT Pumas & Gazelles on exercises in Corsica, and secondly there's the US Army in Korea, the highlight of which is an outstanding set of pictures of the Kiowa Warrior, plus various Apaches, Chinooks, H-60's and a Huey. In future issues of WAPJ, the Variant Briefings will include the CH-47 Chinook, and other aircraft will include the Kawasaki OH-1 and the OH-58D. From the same publisher, Aerospace Publishing, Wings of Fame Vol.14 (April 1999) will include a 20 page article on the Lockheed AH-56 Cheyenne. Thanks to Drewe Manton, Guy Holroyd, Pete Tasker, Stan Klemanowicz, and Glenn Ashley.